With a long and sprawling sun kissed coastline, Spain offers more variety and sparser crowds than its European neighbours. Along with its beautiful scenery and excellent food, Spain is the perfect surf trip destination for everyone from seasoned travellers keen to explore, to those looking to escape for a quick week of fun waves. The nation boasts the longest coastline in Europe, with five thousand kilometres offering a mind boggling amount of variation and quality. There are heavy beach breaks, long barreling points and super shallow reefs – you can guarantee somewhere will always be pumping between September and April, with small fun waves aplenty in the interim summer months. The nation is made up of three distinct stretches of coast, which we’ll break down here, suggesting a few key spots to hit in each. The North Coast – Costa Verde. Galicia occupies the North Western tip of the country, and its rugged landscape and wild weather have earned it the nickname ‘the end of the world’. Like Cornwall Galicia has beaches facing in all directions meaning you can almost always find clean waves. The landscape is particularly stunning here, with rolling hills covered by eucalyptus trees and coves flanked by towering cliffs. The most well known spots in the region are around the town of A Coruna, including the super consistent Pantin which hosts a six Star QS and can provide top quality sand bottomed waves on its day, bank dependent of course. However the real joy of this coastline is searching and there are literally hundreds of setups to find. The best thing to do is take a van or a tent, look at the forecasts and head for a section of coast which looks right for local swell and wind conditions. Next to Galicia sits Asturias, where the coastline falls in the shadow of the Picos De Europa, a beautifully picturesque snow capped mountain range. The stretch of coast boasts a series of epic beachies and river mouths with very little crowd pressure. Many of the best beach breaks also face west and are therefore still clean on the north-easterlies that blow throughout the summer. There are some regional classics which only work on big swells in the winter including a classic left-hand point, a powerful right-hander called El Mongol, and Tapia which is a good heavy beachie. Continuing along the coast to the east, the next region along is Cantabria. Once again known for its beautiful mountain backdrops, the region offers a variety of good quality beach breaks, which are perfect for small to medium size swells. Although generally uncrowded, on good days at the best spots the locals do tend to be a bit more aggy here than elsewhere along the coastline. Somo is the most popular spot in the region, sitting just to the east of Santander offering a long stretch of beach break peaks. El Brusco is perhaps the best sand bottomed wave in the region, offering La Grav style barrels on a big swell. Liencres to the west is also a good quality beach break for when it’s a bit smaller. 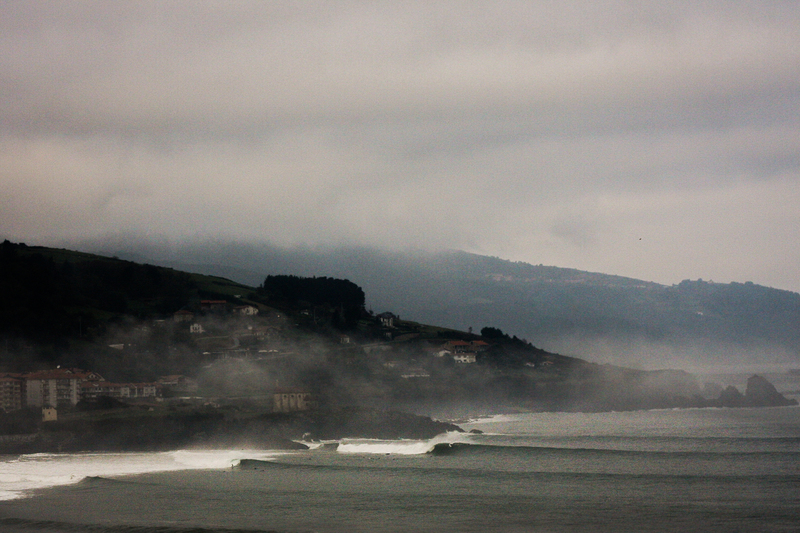 Next up is the Basque country, steeped in history and perhaps the most diverse of all the regions in terms of setups. It features several big wave spots, some reefs, miles of beachies and of course, the world famous river mouth: Mundaka. The surfing population is by far the largest here and competition at the most popular spots like Sopelana and Zarutz is fierce. The region picks up the least swell of the whole of the north coast, so can experience long flat spells in the summer. The surf in Andalucia begins on the long stretches of sandy beach in the province of Cadiz. The coastline, named ‘La Janda’, faces straight into the Atlantic, however the bulge of Portugal to the north creates a swell shadow, so the region requires big low pressure swells, on a south trajectory, to get it working. Like the Northern region the coastline has plenty of bends and turns, meaning clean waves can usually be found. South of there, along the coastline from El Palmar to Tarifa, is where the real potential for amazing waves lies with the highlights including the river mouth left hander at Barbate, Canos De Meca, a long left hand reef and Hierbabuena, which is a good right. Unlike the North coast, the weather is usually warm and mild down in the South West. A surprise to many, The Med actually throws up some pretty good swell now and again. The best time to go is from October to April, as it requires a big storm or a cyclone swell from the Strait of Gibraltar to get it pumping. Barcelona, on its day. See more amazing work from photographer Victor Gonzalez here. 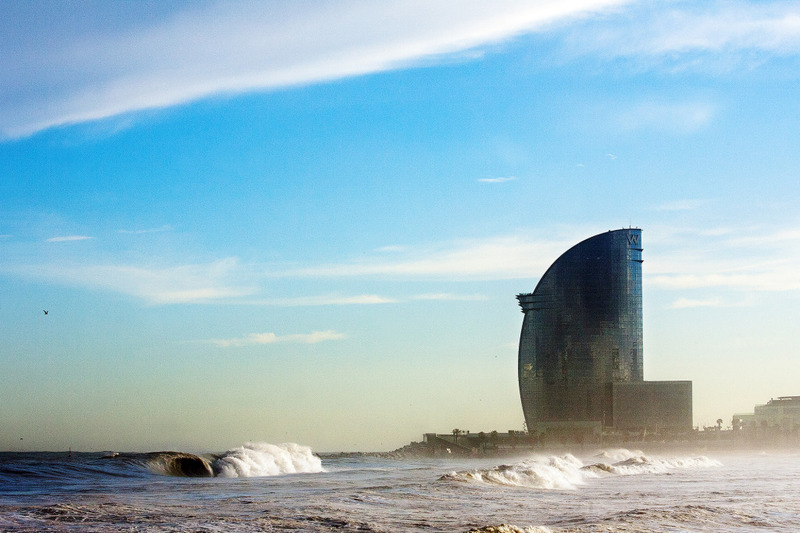 In the centre of Catalonia sits Barcelona, which hosts a powerful beachie in the shadow of the city’s high rises. It starts working at about two foot and can hold up to a solid 10-12, attracting a large crowd on its better days. North of the city is Masnou, where you’ll find Maresme, a fun left-hander, which works on a powerful east or north-east swell, and is a good option if the neighbouring beaches aren’t dealing with the swell size or wind strength. South of Barcelona is Tarragona, where it’s possible to find waves to yourself in the many rocky coves that litter its coastline. Travelling south of Tarragona there are a variety of point breaks stretching all the way to the Ebro Delta. South of Catalonia is Valencia, where surfing has become extremely popular in recent years. The region also features quite a variety of waves. El Saler is a good option on bigger swells, as it handles the size better than some of the other spots and on its day can play host to some of the best barrels in the Med. South of Valencia you’ll stumble across many charming fishing villages like El Perello, where each side of the marina hosts fun waves. Further south is Cullera, renowned for its powerful and hollow waves at the mouth of the Jucar. Continuing down along the coasts, you’ll find more good waves around Javea, Murcia and finally some good reefs near Alicante. 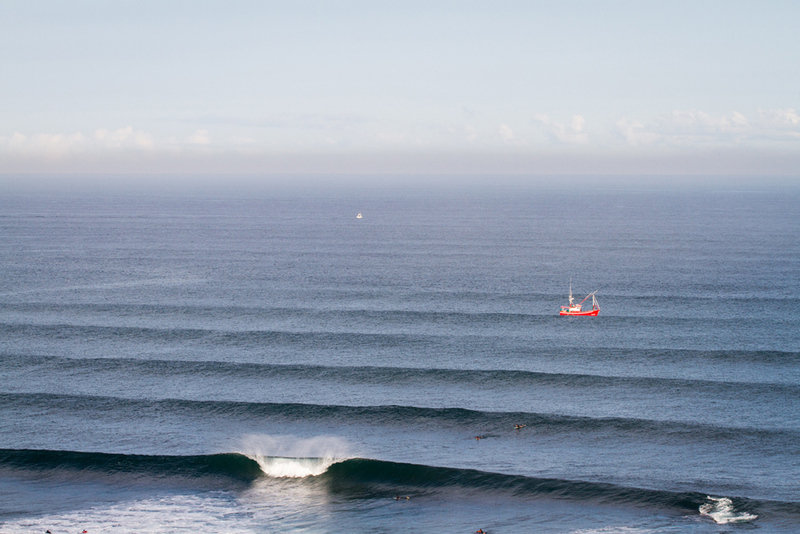 We hope that’s enough info to get you started with deciding where to surf in Spain. As with everywhere you’ll learn more about the place on your first trip than you ever could from online reading, so why not book a trip now and don’t forget to hashtag the snaps of all the epic waves you find with #wlinsta. Want more stories featuring the full breadth of surf culture? Look inside our latest print edition and subscribe today.